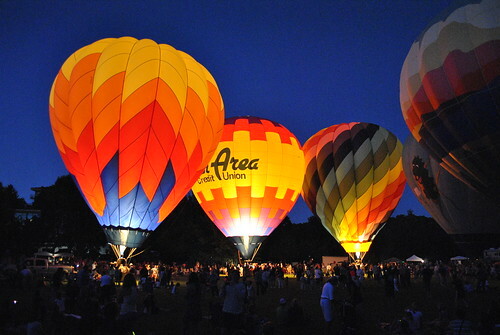 The annual Freedom Festival Balloon Glow was tonight at Brucemore. Five hot air balloons adorned the expansive lawn along First Avenue, along with a live band stand and several food and beverage vendor stands. There was a great crowd out tonight on a very comfortable summer evening. Events like these are fun for all ages and make Cedar Rapids an attractive place to live. See my other photos of the Balloon Glow here. Cedar Rapids-based, non-profit organization S.E.E.D. (Sustainable Ecological Economic Development) will be hosting a Sustainability Symposium “Imagine a Vital Neighborhood” this Saturday with architecture grad students from Iowa State University. Students will present design proposals to stimulate ideas for building a pedestrian friendly, sustainable neighborhood in the Oakhill Jackson and New Bo areas near downtown Cedar Rapids. S.E.E.D. founder and Oakhill Jackson Neighborhood Association President Michael Richards has been collaborating with the College of Design’s “Bridge Studio” for two years. The first year students developed prototype designs for post-flood affordable housing that received the grand prize for the 2009 NCARB Prize for Creative Integration of Practice and Education in the Academy. Professors Clare Cardinal-Pett, Peter Goche, and Nadia Anderson, who was my studio instructor this past fall, will be leading the event. Anyone interested in the revitalization of these neighborhoods and making a more livable, sustainable Cedar Rapids is encouraged to attend. The forum will be held from 10am – 5pm, this Saturday, Jan. 23, at the Community Conference Hall in the Horizons Building, 819 5th St. SE. More information about the event can be found on BJ Smith’s Puncture Proof blog. The 19th annual Iowa City Jazz Festival continues today and Sunday on the Pentacrest in downtown Iowa City. 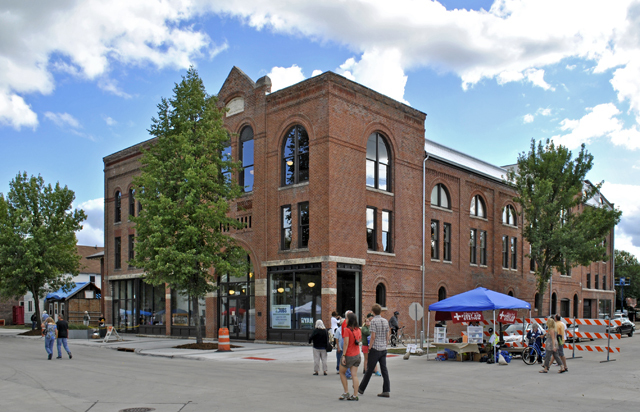 Multiple food vendors are set up along Iowa Avenue and Clinton Street in front of the Old Capitol, along with the dozens of great restaurants and cafes in the downtown area. This event is one of my favorite weekends each summer – good music, good food, and great atmosphere. Fourth of July Fireworks will be take place after the last of today’s performances, usually around 9:30. I’ll be glad to be in Iowa City again this year for the 4th, as the Cedar Rapids Freedom Festival fireworks display this year is only at Kirkwood instead of downtown. 88.3 KCCK-FM is broadcasting the festival live. Check out kcck.org to listen online. The Cedar Rapids Neighborhood Reinvestment Action Plans have been published on the Corridor Recovery website. This plan was developed by Sasaki Associates with a great deal of community input through the Neighborhood Planning Process during the first few months of 2009. It was approved by the City Council on May 13, to guide short and long term redevelopment in flood-affected neighborhoods. The final action plan includes a specific set of tasks to be completed that will compliment comprehensive goals. RIck Smith of the Gazette reports on his city government blog that dates have been set for three public participation meetings lead by OPN Architects, on the future of flood damaged city facilities, including the former home of City Hall, the Veterans Memorial Building on Mays Island. The meetings will be on June 23, August 18, and October 6; location TBD. I look forward to participating as all concerned Cedar Rapidians should. The City officially, at this point, has no position on the matter, whether to return to existing facilities or locate elsewhere, possibly in a brand new building. However, as Rick points out in his post, neither Mayor Kay Halloran, Councilman and mayor pro tem Brian Fagan, or City Manager Jim Prosser seem very adamant about returning to the former location. There is a buzz about the sustainability of facilities as the city moves forward, which some use as an argument for a new, more energy-efficient facility. I am not one to be paranoid, overly-skeptical, or presumptuous of poor decision making about City leaders, and remain generally supportive of their actions and understanding of the current situation the city is facing. I do, however, find it a bit odd, with the issue of sustainability being so important, that returning to the Veterans Memorial Building is not given much consideration. Since the structure is historical, it is required to be renovated. If such an expense will be inevitably required, it would be much more economical – and environmentally sustainable – to return City Hall to where it has been the past 80 years. What could be more sustainable than reusing an existing building? With brand new mechanic and electric systems the building could become much more energy efficient than previously and the City could renovate current space into contemporary office and meeting space that a modern municipal government demands. Renovating and reusing the space the City already has would not only be more environmentally friendly, but also politically. Despite arguments about long-term energy savings with a new or different city facility (which wouldn’t necessarily be the case), getting the City back into City Hall makes sense now and would be a major PR boost for city leaders, who have not fared well in the public eye since the flood. Renovation of the VMC could be completed much sooner than a brand new facility – extending the City’s need for temporary facilities not centrally located. 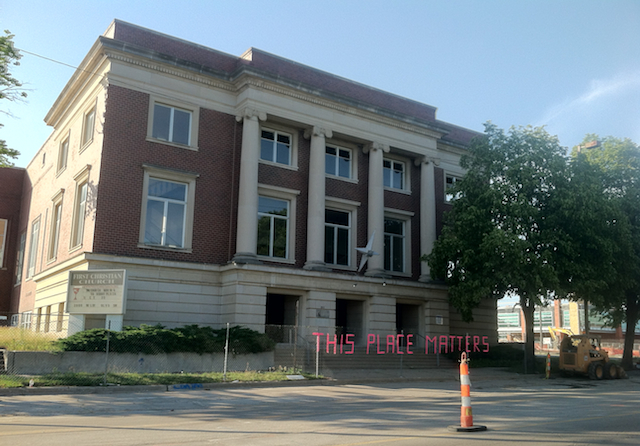 Additionally, I believe it’s the City’s responsibility to the community to make sure this architecturally and historically significant building doesn’t go sitting vacant and underutilized for years to come. The building is an icon of the city; it makes Cedar Rapids unique, unites the east and west, and symbolizes our civic pride. City Hall should return to Veterans Memorial Building on Mays Island. It could be done in a timely manner and makes the most environmental, social, and economic sense. That is my position and why I plan to participate in the public forum. Today I participated in the second of three community workshops for the Cedar Rapids Neighborhood Planning Process for the River Corridor Redevelopment Plan. The focus of today’s workshop was on transportation and connectivity, and land use in the redevelopment plan. Individuals from Sasaki Associates, the Boston design firm selected last year (pre-flood) to develop a riverfront redevelopment plan, were there to present different scenarios and facilitate discussion. The first breakout session was to discuss the strengths and weaknesses of three scenarios presented on transportation, connectivity and open space. All scenarios were based off a tentative plan for a greenway / flood protection system. The second breakout session considered land use and locations to focus housing and business revitalization. My table was fairly diverse – one older man, a retired woman formerly a planning consultant, two women from Time Check, one of their daughters; and our table leader, a planner with the City Community Development Department. Turn out looked pretty good, maybe 150-250, but I could be way off. I saw a lot of familiar faces from City Hall and in the business community. I thoroughly enjoyed the sessions and hearing what other citizens had to say about the schemes, as well as offer my own input. Despite being six hours long, it seemed to go by pretty quickly and was actually really pretty fun for me. I look forward to participating in the next meetings I’m able to make it, as I’ll be returning to Ames tomorrow for school. The next meeting will be Tuesday, March 31, from 6pm – 9pm, at the Crowne Plaza, for scenario evaluation and determining a preferred scenario. The last of three workshops will be April 25. An action plan will be confirmed at a May 5 meeting and will be presented to the City Council on May 13. I encourage anyone and everyone from Cedar Rapids to get involved in this process.